Lexus Design Awards 2017 is an International Design Competition where young designers are inspired to come up with solutions using their designs. Professionals, Students, and Design Enthusiasts can participate in the Lexus Design Awards 2017 without any restriction of the field. The internationally recognized panel of judges will select 12 finalists and out of that 4 winners, who will get the cost of their prototype production (up to 3 million Yen) borne by the sponsors of Lexus Design Awards 2017. The applications are to be made online and must be completed before October 16, 2016. The winners will be announced on the website of Lexus Design Awards 2017 in early 2017. Nationality: The participation to Lexus Design Awards is open to candidates of all nationalities. Age: The participant should be at least 18 years at the time of submission of the entries for the Awards. Educational Qualification: There is no strict rule related to educational qualification of the candidate. The competition is open to professionals, students and design enthusiasts. The employees of Toyota Motor Corporation, LEXUS International, design boom srl and related organizations along with their family members are not eligible to be a part of the awards. Mentorship: The four selected prototype will get mentorship by a renowned professional who will supervise the prototype development of the submitted work. The cost of Prototype production: The cost of prototype production up to 3 million Yen (Approx. 16 Lakhs) will be covered by the sponsor. Trip to Milan: The sponsor will bear the expenses of the one economy class round trip from finalist's home to Milan, Italy along with accommodation for 2 nights to attend Milan Design Week on April 12-17, 2017 for 4 Prototype Winners plus 8 additional panel finalists. In the case of Team participation only one representative will be invited to the event and the expenses only one person will be covered. Registration form: Applicants are required to complete the online registration form in order to be a part of the Awards. The number of entries: candidates can submit any number of entries, there is no limit on the number of entries to be submitted by an applicant. The entries will be accepted only in digital format and not in physical delivery. Dimension: exact width of 818 pixels / 72 dpi. Size: 200 kb or less. Number of Images: maximum 6. Note: Video in FLV format having the size less than 10 Mb can also be submitted but are not necessarily required. Explanations: Candidates are required to submit a brief description of their design explaining the research and point out the artistic and technological qualities. Toyo Ito: The Pritker Prize Winning Japanese Architect. Birgit Lohmann: Co-founder and Editor-In-Chief of Designboom. Alice Rawsthorn: Author of 'Hello World: Where Design Meets Life'; and Design Critic For the New York Times and Frieze Magazine. 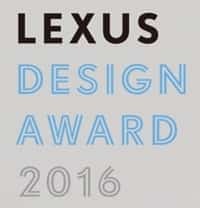 Result: The result of Lexus Design Awards 2017 will be declared on April, 2017.